The Program Structure Tool lets you view the hierarchical structure of the procedures and variables in a program. This is useful for understanding the relationship between the variables and procedures. You can access the Program Structure Tool by selecting the Debug -> Program Structure tool option from the menu bar. 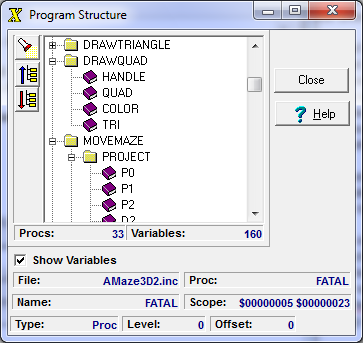 The program structure is displayed as a tree diagram of procedures and variables. The diagram shows the structure of the program. It shows which procedures are nested inside other procedures and which variables are local and global. The information is only available after the program is compiled, although partial information may be available even if there is a compile error. Global variables are located in the Main folder at the bottom the list. Show Variables check box. This check box turns the display of variables on or off. When the check box is off, only procedures are shown. Pressing this button brings up a standard search dialog that lets you search through the list for a specific variable. This button collapses the tree so that only the top level variables and procedures are visible. This button expands the tree so that all nested variables and procedures are visible. Status Display. The Status Display provides technical details about the currently highlighted symbol. This includes the corresponding Procedure Name, the Variable Name, the Scope of the Variable in I2L Program Counter values, the Level and Offset of the variable and its data type.